Thank you for your letter, dated 6/29/18, in which you address a number of issues of great mutual concern. It is our hope that this response will address your issues in a satisfactory way. We apologize for the delay in our response. While you asked for an immediate response on specific items, we felt it was important to listen to the Deaf and interpreter communities before responding. Below is our response to each of the three demands. 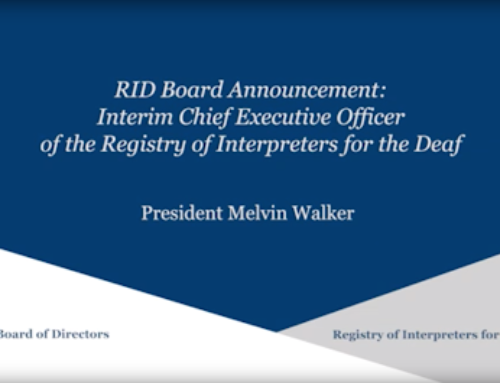 As the nation’s only national certifying body for ASL/English sign language interpreters, RID is always cognizant of its role in service to Deaf people and the Deaf community. We have always treasured our relationship with the NAD. The tensions of recent years have been painful for both organizations and have impeded progress on a number of very important and mutually beneficial efforts. The NAD’s involvement in this task force ensures that those who are most affected by unethical behavior – the Deaf consumers – are proactively protected. When violations occur, the Ethical Practices System (EPS) provides recourse through mediation or adjudication. We wholeheartedly agree that the CPC needs to be updated. We understand that the intent of the CPC is “Do no harm.” The idea of adding language that prohibits an interpreter from opposing the civil or linguistic rights of any deaf, hard of hearing, or DeafBlind person is a good consideration for the joint NAD-RID CPC Review Task Force, and we would support that. To address this, we will add a clause to our employee manual which would prevent an employee from making any statements or engaging in any conduct that is adverse to the civil or linguistic rights of any Deaf, hard of hearing, or DeafBlind person. As all Board members are certified interpreters, they are bound by the Code of Professional Conduct and are expected to behave accordingly. 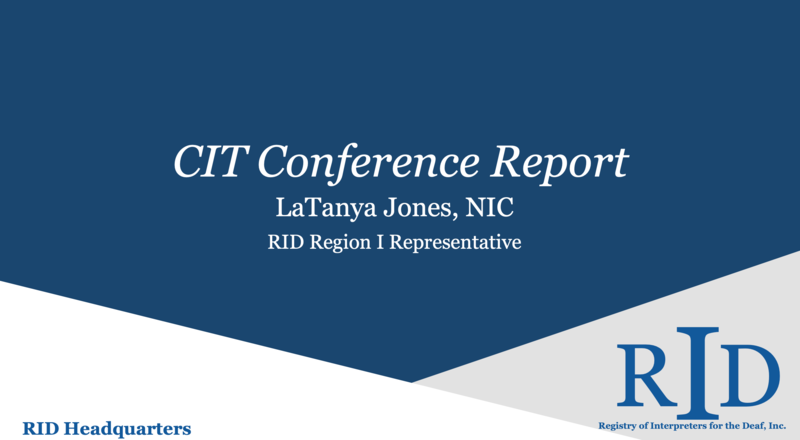 An improved and strengthened CPC from the joint NAD-RID CPC Review Task Force (again, reviewed and approved by both organizations) would cover Board conduct, both in their duties as Board Members and as interpreters. 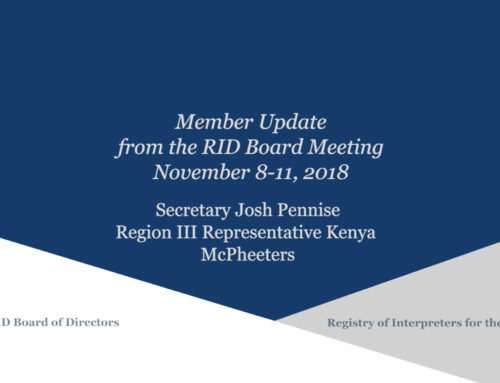 In the meantime, we have added a motion to the August Board meeting that would restrict Board members from serving as expert witnesses in any case related to interpreting, or where the civil or linguistic rights of Deaf or hard of hearing persons may be adversely affected. This is multi-faceted and needs to be broken down for clarity. 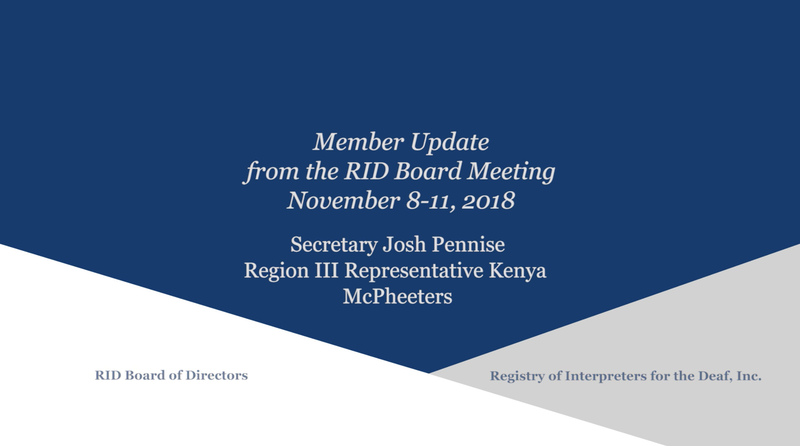 First, we vehemently disavow any expert witness reports and testimony by RID staff and RID Board members that are adverse to the civil and linguistic rights of Deaf, hard of hearing, and DeafBlind persons. In your letter, you specifically addressed various involvements by Ms. Anna Witter-Merithew in her capacity as an expert witness in various cases. Ms. Witter-Merithew was not an employee of RID. 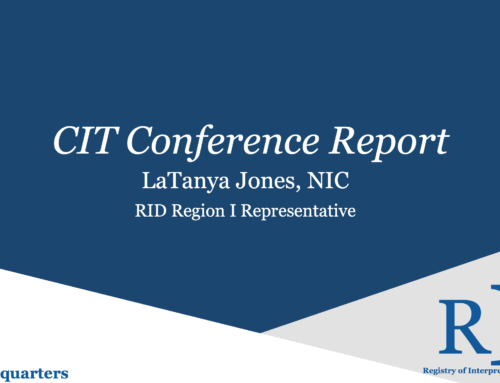 She was contracted part-time as RID’s Interim Executive Director (IED) for three years with specific job tasks. She agreed to serve as the IED so RID would have the time it needed to recruit and hire a long-term replacement. Her work as an expert witness was not part of her duties as IED and was completely separate from her work as a contractor with RID. Any opinions she expressed serving as an expert witness were hers alone and were not the opinions of RID. 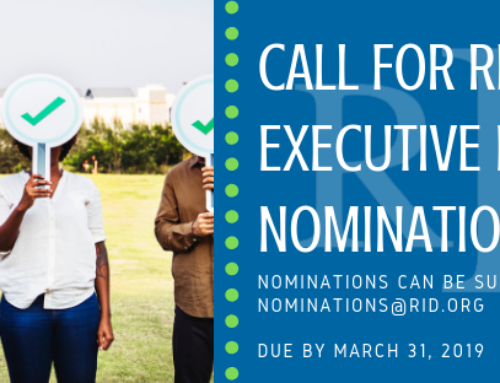 RID had no influence over her other activities outside of her contractual obligations to the organization as Interim Executive Director. 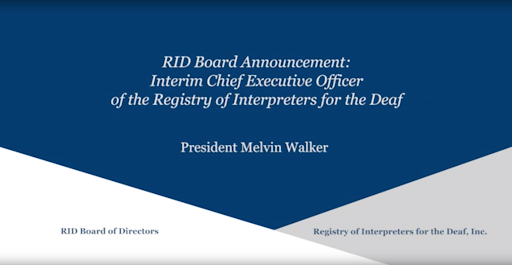 RID is committed to the civil and linguistic rights of Deaf people and has always joined efforts to ensure access to the highest quality interpreters, who are appropriate for the setting, in every situation. These principles are embodied in our Code of Professional Conduct. As we have said above, we look forward to a joint effort to improve and strengthen the CPC in content and in scope. We hope that the reassurances and invitations offered here affirm to the NAD our commitment to the Deaf community – to do no harm, to ensure access for Deaf, hard of hearing, and deafblind people to certified and qualified interpreters, and to protect the civil and linguistic rights of Deaf people. We look forward to a continued dialogue and continued, new, and renewed partnership on all of our shared initiatives.